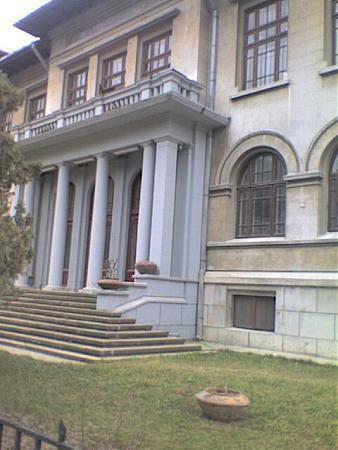 On Thursday, I was able to practice piano at the National University of Music Bucharest (UNMB). My venue was ideal. Set at one end of a small performance hall, there was a new Yamaha grand piano, similar to the one shown here. There were plenty of chairs, but no actual people listening. There was a nice view of trees and the rest of UNMB outside the fourth-floor windows. On the wall was a poster advertising the George Enescu annual international music festival. As one of the world’s best modern composers, Enescu was also an outstanding violinist, pianist, and conductor. The poster displayed his image looking directly at my seat at the piano. I decided to start with Beethoven’s Sonata No. 31 in A♭, Opus 110. I’ve been working on this one for a long time. It’s very challenging for me, although there are moments when I can play it well enough to get lost in the beauty of the music. When I started I couldn’t help but notice Enescu’s stare. According to Wikipedia/Vincent d’Indy, if Beethoven’s works were destroyed, Enescu could reconstruct them all from memory. Would he approve of my feeble efforts? Was it an insult to his memory to be playing that beautiful sonata in front of him? I knew that he knew I was missing notes, stretching the rhythm, and phrasing in ways Beethoven never imagined. It must have pained his musical ear, if not his musical soul. But he knew, as I’m beginning to learn, that with practice those things can improve. What mattered was to bring my full attention to the music. I plodded along, trying to ignore all the distractions. Then it happened. Maybe it was because I realized this was just between Beethoven, Enescu, and me. No one else was there. The wonderful venue didn’t matter. And Enescu had made it clear he wasn’t relevant either. For the first time, I really began to hear the music. I played the entire sonata beginning to end. Forget the fact that my tempo was about a third of Enescu’s and that the list of “areas for improvement” would be longer than War and Peace. Enescu helped me, just for a moment, to go from struggling to experiencing. I think of his lifelong passion of music, and what it must have meant to him to feel that kind of loss of self and immersion in music as he both traversed and added to the repertoire. We don’t have any further performances scheduled at the Conservatory on this trip. I’m sorry if you missed it! The video clip (1978) is of Enescu’s Romanian Rhapsody N° 1 Op 11, with Sergiu Celibidache conducting the Bucharest George Enescu Philharmonic Orchestra at the Romanian Athenaeum. This entry was posted in Uncategorized and tagged culture, music, Romania, university. Bookmark the permalink. If I had known you were performing I would have been there! Thoroughly impressed by your European tour of pianos and count on more to come. Also impressed that you were playing Beethoven’s sonata 31. So thank you for all that — a welcome start to this sleepy, cool, rainy Sunday morning which happens to be Mother’s Day, at least here if not there. And for this delightful vicarious visit to Romania, almost as good as being there. Any chance you can find some hot crazy gypsy music? There must be tons of small groups on every street corner, no? yes?